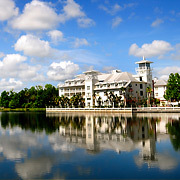 We are partnering with some of the best hotels in the area to insure you have a great experience! Located about one mile from the start and finish lines, the Melia rooms all have full kitchens, so race day food prep is no problem! One bedroom, two bedroom, and two bedroom family suites are available. Call (407) 964-7165 for reservations (8am-7pm) and mention the Celebration Marathon. Taxes and resort fees are not included in these rates. Located within 1/4 mile of the start and finish lines, the Bohemian Hotel Celebration is in the heart of downtown Celebration with easy access to restaurants and shops. ​This is a small room block, so make your reservations early.